Reciprocal privileges do not include mailings from other reciprocal organizations. Participation in the reciprocal program continues on an annual basis from year to year. The program is limited to the Affiliate organizations’ Smithsonian Affiliate members only. To discontinue participation in the reciprocal program, the Affiliate must submit a written form to Affiliations in January in accordance to the annual cycle. Each Affiliate is responsible for marketing and promoting the Smithsonian Affiliate Reciprocal Membership information to its own members. To join the reciprocal network, complete the registration form and return by email or fax. 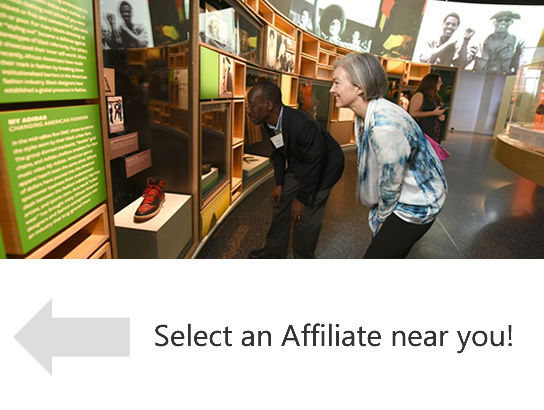 Simply present your Smithsonian Affiliate Membership card when visiting any of these participating Affiliates and enjoy special discounts and benefits. The Smithsonian Affiliate Reciprocal Membership Program is a network of Smithsonian Affiliate museums and educational organizations. Smithsonian members from one of the participating Affiliate organizations (see list of participating Affiliates) who present a current Smithsonian Affiliate membership card are entitled to privileges at participating Affiliate organizations. For more information about participating in the reciprocal program, contact Natalie Wimberly (202) 633-3021; WimberlyN@si.edu.